A weird, complicated, simple, dramatic, Aspen-based soap opera of a legal case started trial yesterday. The City of Aspen is suing two wealthy condo-owners and the developer/landlord of the rest of the building for privatizing the only accessible entrance. It’s a smaller but more disturbing version of the “poor door” controversies in New York and other cities, where affordable housing tenants are forced to use a side entrance to mixed use buildings. Elise Thatcher of Aspen Public Radio interviewed me about it on Monday and posted the Court’s decision granting in part and denying in part the City’s motion for summary judgment. 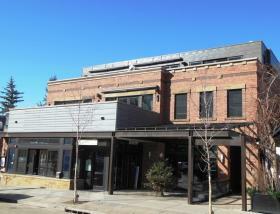 In short, JW Ventures, a developer in Aspen, Colorado, constructed a building in downtown Aspen to include two “market value” apartments, three “affordable housing units,” and two restaurants. It also had, as required, an accessible entrance from the sidewalk with an elevator serving all apartments and the two restaurants, as well as an alley entrance and service elevator. Fast forward to today: the owners of the two market value units — a couple who combined them into a single apartment (the “Fancy Apartment”) — have asserted that the street-side accessible entrance and elevator are theirs alone, and that tenants of the affordable units and patrons of the restaurants must use the alley entrance and service elevator. The legal case, brought by the City of Aspen to enforce its own ordinance, centers around the city’s conflicting actions with respect to building and condo plans. I’ll get to the untested ADA and Fair Housing angles in a second. So, I called Cunniffe who said, Denis Murray of the bldg. dept has a personal agenda with handicap usage because its his personal MO (he’s handicapped). We may not be able to exclude Jews from our apartment building. That code inspector has a personal agenda with anti-Semitism because it’s his personal MO (he’s Jewish). See how that works? Not OK, right? In fact, prima facie evidence of discriminatory animus IMHO. In case Cunniffe’s appalling disability discrimination weren’t enough, he goes on, per the email, to recommend illegal retaliation. If [affordable housing] tenants don’t like that and want to make an issue, the building owners have the right to terminate their lease based on being noisey, pet issues, smoking, etc. In other words, if they stick up for their rights under the Fair Housing Act, just find a pretext to kick them out. ZZzzzzzt! You lose! That violates 42 U.S.C. § 3617, which prohibits retaliation for asserting rights under the FHA. Stepping even farther aside, this is an object lesson in privilege. The wheelchair-using code inspector is likely a well-educated, competent guy. Maybe he has a degree in architecture or engineering. Maybe a professional license or two. But when he takes the radical position that JW Ventures should comply with federal law and municipal ordinance, he is reduced to his wheelchair and his views dismissed because of it. If the email is accurate, this guy Cunniffe was determined to discriminate and retaliate, so even if Murray were not disabled, Cunliffe might have disparaged him as a bureaucrat or a jerk, but his views would not have been brushed off as a mere product of his minority status. Back to the legal case. Turns out the city required, in the ordinance permitting the redevelopment, that the building be accessible and approved plans showing access from the street to all units and both restaurants. The city later signed off on a condo map showing the street-side entrance and elevator as within the exclusive control of the Fancy Apartment. It is the conflict created by these apparently contradictory actions that is being tried — under the City ordinance — in court this week. Because this case was brought by the city to enforce its ordinance it does not address the ADA or FHA, but I will. JW Ventures designed and constructed the building in around 2010. The apartments are thus covered multifamily housing under the FHA and the restaurants are places of public accommodation under Title III of the ADA. All were required to be accessible when built — and apparently were. * Having done this, JW Ventures, as the landlord, has to maintain the features that were originally required to be accessible. This would require it to keep the elevator in good repair; naturally, taking affirmative steps to prevent use of the elevator would be covered by this provision as well. Both the FHA and ADA also require reasonable accommodations/modifications in policies and procedures, so the landlord would also have to modify a policy that barred people from the accessible entrance. Bottom line: should a resident or guest of one of the affordable units or a patron of one of the restaurants require wheelchair access, that person would have the right to use the entrance and elevator currently privatized based on the landlord’s policies. This may be a one-off situation, based on the complex set of conflicting communications during the building and condominiumization** process. But if more and more mixed-use buildings are going to have “poor doors,” they may find themselves in violation of the ADA and the accessibility provisions of the FHA, in addition possibly to FHA disparate impact provisions, and of course common decency. * Lawyerly disclaimer: I have not seen the place, so I can’t vouch for its accessibility. Everyone seems to agree that the street-side entrance and elevator would provide compliant access if not restricted. ** Yes, this is a word. This entry was posted in Accessibility Fail, Disability Rights, WTF?! and tagged 308 E Hopkins, aspen, aspen public radio, charles cunniffe, elise thatcher, jw ventures on October 1, 2014 by Amy Robertson.